SEL is the process of acquiring the following five core interrelated competencies: self-awareness; self-management; social awareness; relationship skills; and, responsible decision-making. These are identified as “five interrelated sets of cognitive, affective, and behavioral competencies” by the Collaborative for Academic, Social, and Emotional Learning (CASEL), an organization with the goal of “establishing social and emotional learning as an essential part of education” -- nationally and internationally. (The figure to the right is from the CASEL website.) 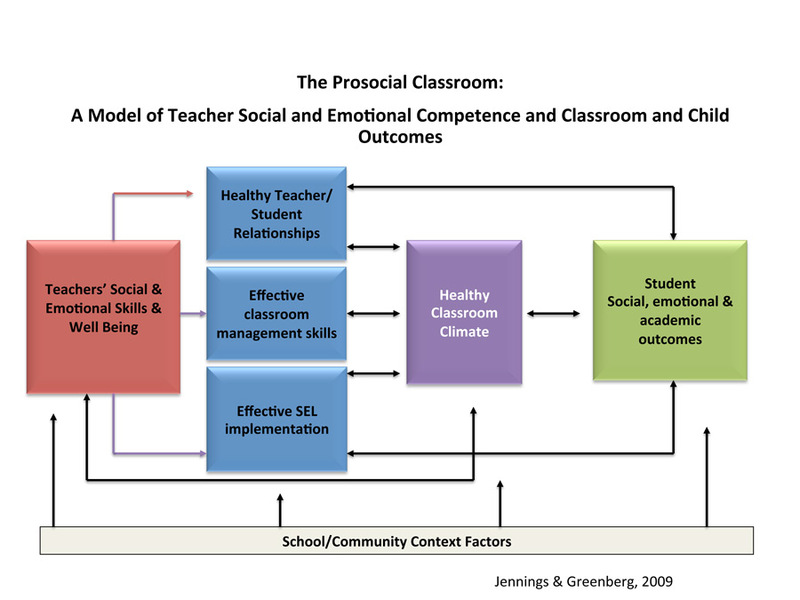 While SEL is an umbrella term, encompassing a range of interventions, the anchoring aim of this approach is to promote development of the five core competencies, all demonstrated as necessary for success vis-a-vis academic achievement, relationships, the workplace, civic engagement, etc. "Emotional intelligence is the set of abilities that underlie competency in dealing with and acting upon emotion-relevant information. It includes the ability to perceive, appraise, and express emotion accurately and adaptively; the ability to understand emotion and emotional knowledge; the ability to use feelings to facilitate cognitive activities and adaptive action; and the ability to regulate emotions in oneself and others" (Lopes & Salovey, 2001, p. 12). Teaching and learning is the primary task for K-12 schools. And, improving instruction is a primary goal for school climate improvement efforts. Educators...are always social, emotional, ethical and civic teachers. The only question is to what extent we are doing so consciously, intentionally, systemically and helpfully? What are the competencies and dispositions that we want and need to promote? There is not “one list” of social, emotional and civic competencies / dispositions that practitioners and scholars adhere to. Perhaps the most commonly used list grows out of the work of the Collaborative for Academic, Social and Emotional Learning (CASEL). This conceptualization is based on the idea that there are five key sets of social emotional learning/emotional intelligence skills: (i) self awareness; (ii) social awareness; (iii) self management and organization; (iv) responsible decision making; and, (v) relationship management.